More data in via African Raptor Observations and our first helicopter survey data by spread sheet. New data has been received by spread sheet (see the list and map below) and added into the ARDB from Andre Botha (467, South Africa) and Joseph Heymans (43 driving survey records, South Africa and 789 helicopter survey records of White Backed Vulture nests along the Limpopo River). This is our first helicopter survey data and focused nest survey! – Great job Joseph! We have also received data from Bruno Bargain (1,361 from Senegal) which is pending submission into the ARDB whilst we validate the coordinates. Thanks very much for these data! In addition to the data received via spread sheet we’ve also received 1,015 records via African Raptor Observations; the ARDB’s Android mobile app. Importantly our user base is growing with 24 different users contributing data (see the list and map below). Data is mainly coming in from South Africa (607) and East Africa therefore, we’re really keen to push the app’s adoption further North and West. Remember that it’s free to download and use! Feedback so far has been very positive with one user telling us that they’re now far more aware of all raptors whilst out and about thanks to using the app! The app can be downloaded at http://goo.gl/ne7NKC. We’re able to really analyse the data that we’re receiving via the app allowing us to pick out, amongst other stats the number of birds which were spotted perching, nesting or the country they were observed in. The list below shows the different activities noted. The survey results are very promising too with a total of 6,782 km travelled over 162 hours! That’s not far off travelling from the very North of Africa to the very South! The accompanying survey data means we can do so much more with the observation data. We’re nearly at 100,000 records which it would be brilliant to achieve by the end of 2014 so please get out and about recording raptors! 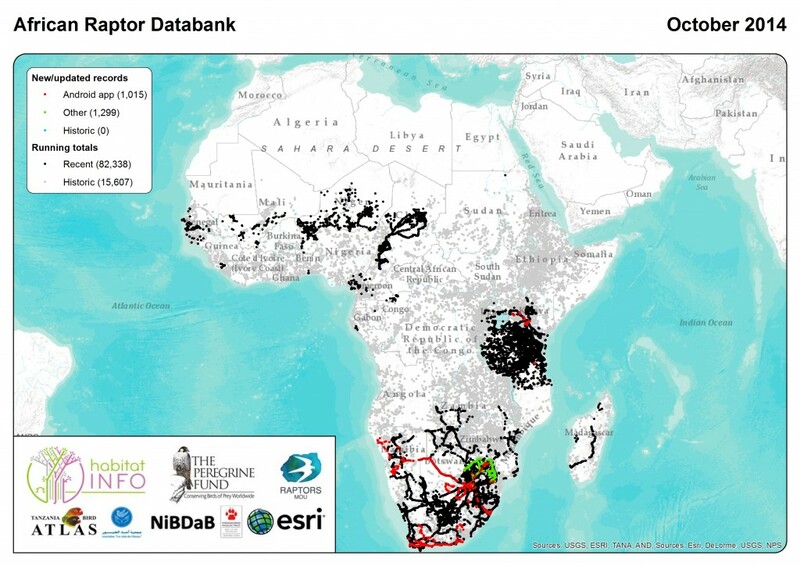 Don’t forget to register with the ARDB at http://www.habitatinfo.com/ardb and download African Raptor Observations to your Android smart phone from http://goo.gl/ne7NKC.